The Cosby And Yanez Juries Appear Deadlocked. Now What? 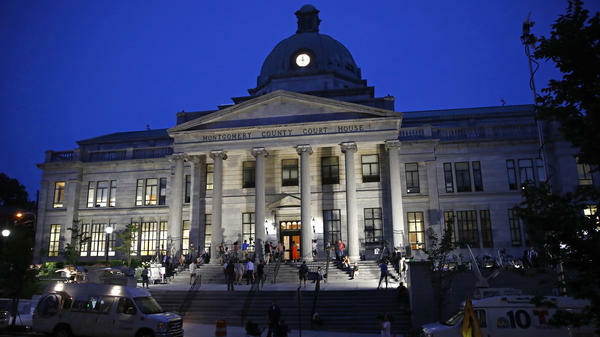 People gather on the steps of the Montgomery County Courthouse in Pennsylvania this week as jury deliberations in Bill Cosby's sexual assault trial take place. Two juries deliberating in high profile criminal trials this week appeared to be unable to reach agreement on a verdict. The judges overseeing those trials sent the jurors in both cases back to continue deliberations. In Pennsylvania, four days after getting the case, the jury considering sexual assault charges against Bill Cosby told the judge they couldn't reach a unanimous decision on any of the three counts against the 79-year-old actor and comedian. The judge directed them to keep talking and as Thursday evening fell, the panel of seven men and five women were still at it. In Minnesota, the jury considering the fate of a police officer charged in the shooting death of a black motorist, Philando Castile, finished its fourth day of deliberations Thursday without reaching a verdict, went home, and resumes deliberations Friday morning. With these two high profile cases seemingly teetering on the brink of hung juries this week, you might think it happens quite often. But hung juries are actually relatively rare, happening about 5 to 6 percent of the time in state criminal trials, and about 3 percent of the time in federal criminal trials, according to Valerie Hans, a law professor at Cornell University who has researched deadlocked juries. On Wednesday, it appeared the jury was deadlocked over whether to convict officer Jeronimo Yanez of manslaughter and two other counts in the killing last year of 32-year old Castile. The judge overseeing the trial reread instructions he had given jurors Monday, reminding them to "discuss the case with one another, and deliberate with a view toward reaching agreement, if you can do so without violating your individual judgment." When jurors indicate that they are unable to reach a decision, there are limited steps a judge can take to help break the impasse and, according to legal experts, and that can often do the trick. "It's not uncommon for a jury to be deadlocked at first but then to reach a verdict after some prodding from the judge," says Larry Cunningham, vice dean and professor of legal writing at St. John's Law School in New York, and a former prosecutor. To break a deadlock, he says judges can deliver what is known as an "Allen" (after Allen v. United States , a Supreme Court case) or "dynamite" charge. "The judge instructs the jurors that they should each reexamine their beliefs, go over the evidence, listen to the opinions of others, and understand that if a mistrial is declared, another jury will have to be empaneled to hear the same evidence — all at considerable expense. But, the judge also tells the jurors that they should not compromise their closely-held beliefs just to reach a verdict and go home." That's exactly what the judge hearing the Cosby trial has done. But there are limitations to what judges can tell jurors, and that can vary from state to state. "The judge can say, 'Do you think more deliberations would be helpful?' But the judge can't say, 'How are you split?'" explained Bradford Colbert, a professor at Mitchell Hamline School of Law in St. Paul, in an interview with Minnesota Public Radio. "It's impossible to tell whether you've convinced 11 out of the 12, and you have one lone hold-out, or if it's evenly split ... because the judge can't ask how split you are." Arizona does allow judges to ask jurors what issues divide them and then ask whether further instruction or attorney argument would be helpful, which can sometimes help juries resolve a case. But if the jury is still unable to reach a unanimous decision, and the judge believes further deliberations won't change the result, the judge can declare a mistrial. Prosecutors must then decide whether to retry the case. As to why juries deadlock, Hans of Cornell Law says "the number one reason we have found from research is the evidence being closely balanced." "Usually in hung juries there is significant disagreement at the start of deliberations, even if by the end only one or two disagree with the group." There isn't much evidence indicating that hung juries are more common in higher profile cases that are capturing a lot media attention. "My experience has been that jurors take their jobs very seriously and will not compromise strongly held belief just to reach a verdict," says Cunningham. "I've seen deadlocks in even the simplest of misdemeanor cases." And he doesn't think requiring unanimous verdicts in criminal cases sets too high of a bar to reach a verdict, because of what's at stake. "We must remember that the consequences of a criminal conviction are high: a person can lose his liberty or even his life," says Cunningham. "He can be branded as a felon, lose the right vote, and be barred from certain jobs." Requiring a unanimous verdict can serve as check against a wrongful conviction, Cunningham adds, and properly holds the state to its burden of proving the accused guilty beyond a reasonable doubt. Cunningham says when he was about to try his first case as a prosecutor, a senior attorney in the office advised him to not ask too many questions during jury selection and not challenge too many prospective jurors, telling him "If you can't prove your case to a cross-section of our community, you have no business trying to put the defendant in jail." "That lesson has stayed with me."